The taste of freedom was one to savour on my first Sunday away from the office for months over the Easter break. What was I to do with an entire selfish day to enjoy? There are those who would have slept in until midday, but knowing there were bargains out there calling my name*, I could not rest, and made the trek to Camberwell market with a wallet full of coins just waiting to be exchanged for MORE STUFF. I have to say my haul was minimal and I purchased one item which I now regret, but at $10 it’s not something that is going to cause me sleepless nights. (It was a grey bag that I thought was leather, but turned out to be vinyl. Such a disappointment, but the psychological scars are healing. Slowly). 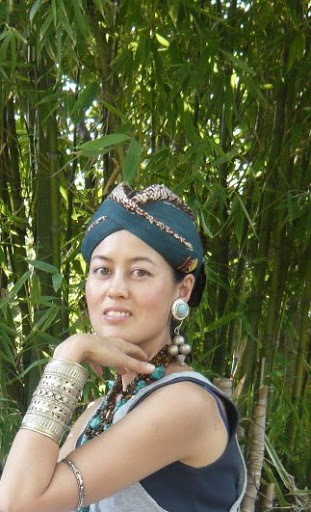 Anyway I was happy to find this turban headdress which probably was made for some sort of Indonesian performance, as it’s a batik material. It’s quite possibly sacrilege for a female to wear it as I’m guessing it’s male headgear, but for my purposes (ie, displaying alongside other gloriously ethnic artefacts and using it to add styling interest to outfits which will probably never be worn outside my own backyard) it’s not a problem. I’m wearing it with tigereye and turquoise necklaces, a cuff I bought in Turkey but which is probably from one of the Stan countries (as in Kazakhstan, Afghanistan, or the less well-known Aberglenistan) and a bracelet (actually probably a shirtsleeve thingy like what bankers wear in old movies) which is stretchy but instead of using elastic, employs ingenious engineering with tiny springs inside each separate “bead”. 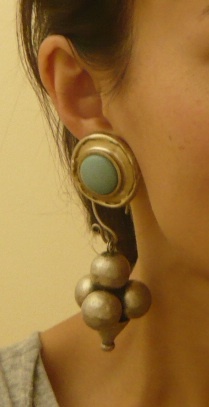 Also earrings from Laos – well the bulky silver ball part is anyway. As I don’t have my ears pierced I had to loop them through clip-on earrings which were a lucky present from the fabulous Nicole who is the source of many of my most prized accessories. I’m going to do a post just about all the amazing stuff she’s given me over the years, although the sheer volume nearly warrants a separate blog. And the clothes? The grey singlet is from a Balenciaga collection ages ago and was a generous gift from the lovely Avi when he grew out of it. And underneath it, a navy Esprit singlet from about a billion years ago when I was still in high school!! Which makes it vintage, no? *Also known as “crap that no one else would ever even consider actually paying money for”. It's still one of my favourite Balenciaga collections – the one he got into trouble for – for ripping off obscure dead designer Kaisik Wong and not acknowledging him! Ooh you've enlightened me, I didn't know about that designer, will have to look him up when I get a spare minute! I loved that collection too, all the patchwork and cargo pants… will I get in trouble if I say I liked his old stuff better than his new stuff!? hey there! thanks for getting in touch. How good is the camberwell market?! My sunday ritual with KeepCup in hand! You´ll be surprised how many peeps ask where I get my keepcup from at the market! No you won't (get into trouble) I tend to agree with you. When he first started out at Balenciaga, it was avant garde and edge BUT beautiful as well at the same time. Perhaps because everyone else caught up, he felt he had to go down the weird route, without it being classically beautiful but I suppose that statement in itself brings up the question of What is beautiful? I don't know if you've noticed that Balmain and Givenchy seem very popular but in essence they're using the same silhouette as Ghesquiere from all those years ago. The hipslung boy cut trousers, etc and people respond well to it because again, while edgy it's beautiful and wearable. I feel that's probably what pisses him off.